We want your views! The public, local agencies and organisations are invited to give their views on the Draft Management Plan for the North Devon Coast Areas of Outstanding Natural Beauty (AONB). As a statutory document, the Plan needs to be produced for March 2019. The AONB Partnership, comprising over 25 organisations and 9 community representatives, decided that the five-yearly Review should be a light touch one this year, given the significant changes to domestic agricultural and environmental policies and the proposed departure from the European Union. The AONB team has held ‘expert debates’ with regional and local representatives to update the forces for change and trends that are impacting on the AONB. The Plan includes a vision, objectives, policies, performance indicators and some priority actions, but it has been decided to produce annual delivery plans rather than a five year one, due to the changing domestic and European policy context. The Plan can be consulted in several different ways: it is available online through the AONB website at http://www.northdevon-aonb.org.uk/about/management-plan-2019-2024 and hard copies of the report can be seen at the following venues: Barnstaple and Bideford libraries; North Devon Council offices at Lynton House, Barnstaple and Ilfracombe; Torridge District Council at Riverbank House; Combe Martin Museum and Information Point; and Braunton in the Countryside Centre (until 3 November – then at Braunton Library). 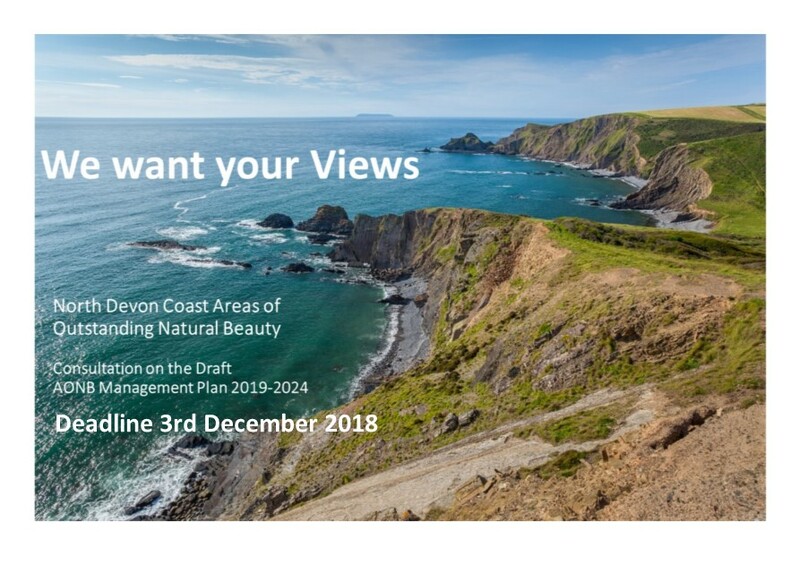 The consultation is open until Monday 3rd December 2018 and responses can be provided in writing to the AONB at Taw View, North Walk, Barnstaple, EX31 1EE or by email to aonb@devon.gov.uk . A State of the AONB report is available to demonstrate progress over the previous five years in meeting objectives and indicators.